Don’t break our hearts with false promises. Historically, trade unions in South Africa have played a significant role in shaping the political landscape, especially during the struggle against apartheid. But the union movement has declined globally in influence as the growing informalistion of work has eroded its power and unions are seen as protecting the special interests of those in regular employment. With increasing numbers of people outside the formal employment net, unions have had a tough time defining their role. Yet the rights won by South African workers in the struggle for democracy continues to give them a degree of influence unsurpassed in post-colonial Africa. The new federation was conceived over two years ago in the wake of the expulsion of National Union of Metalworkers of South Africa from trade union federation, the Congress of South African Trade Unions (Cosatu). The expulsion signified growing political realignment in the country given that Cosatu is in an alliance with the ANC. The union’s expulsion was followed by that of Cosatu general secretary Zwelinzima Vavi. So what difference is the new federation likely to make to the lives of workers in South Africa, as well as the very large number of unemployed people and those in the informal economy? Significantly, the new federation is not the outcome of a surge in worker militancy. Instead, it’s a response to the perceived failure of existing unions to provide an adequate voice and service to their members. The new federation is in fact the product of the crisis facing traditional trade unions across the globe. A strength of the federation will be its ability to combine the experiences of long standing union leaders with a new generation of unionists disillusioned with the governing party and its two alliance partners – Cosatu and the South African Communist Party. With nearly 700 000 members, it’s the second largest federation in South Africa after Cosatu. But the challenges facing an attempt to “cross the divide” between organised workers and the growing precariat - those in casual, outsourced and informal jobs - will require strategic leadership willing to move out of the comfort zone of traditional unionism, recruit unfamiliar constituencies and experiment with new ways of organising. The first challenge will be to break with the bureaucratic practices that have seen many union leaders gradually distanced from their members. If the practices of “business unionism” - where unions come to mirror the values and practices of business - are to be challenged, two big issues will need to be revisited. These are union investment companies and the gap between the salaries of some union leaders and their members. The new federation could make its mark within the labour movement by taking lifestyle issues seriously and, in particular, the wage gap within its own ranks. 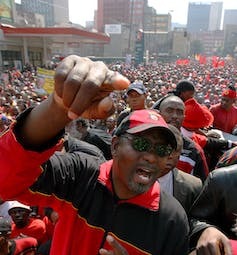 Zwelinzima Vavi, secretary general of the new trade union federation Saftu. The second challenge is around political diversity. What was striking at the launch was the wide range of political and ideological views. An illustration was the lively debate over the relationship between pan-Africanism and Marxist-Leninism. But there was consensus that there should be no party political affiliation. Saftu, it was agreed, should be politically independent. The challenge will be for the new federation to be a genuine forum for political debate, respecting different views, and even allowing different ideological factions to be institutionalised. The most difficult challenge arises from the shift from industrial unions to general unions. The National Union of Metalworkers of South Africa led the way when it extended its scope to include a variety of economic activities beyond metalworkers. This included, for example, university cleaners and bus drivers. Furthermore, many of the Saftu affiliates are general unions. How to deal with the danger of internal “poaching” of members was extensively discussed at the launch. Will the protocols proposed in the report of the steering committee prevent divisive conflict in the future? Another major challenge facing Saftu is the need for innovative strategies on new ways of organising. It’s not clear how the federation intends to recruit the new constituencies of women, immigrants, low paid service workers, outsourced workers and the growing numbers of workers in the informal economy. Experiments in organising precarious workers, such as the Casual Workers Advice Office in Germiston, need to be examined as they could provide ways of crossing the divide between the old and the new. Another difficult challenge will be defining the federation’s position on economic policy. Harsh criticisms were made of the proposed national minimum wage of R20 an hour. But maybe it is time to confront the dilemma that for many workers a bad job is better than no job. Has the time not arrived to go beyond the demand for decent work to explore what kind of role trade unions have in a developing country such as South Africa, in the context of a uni-polar world, dominated by neo-liberal capitalism? The leaders of the new federation are confident that a number of Cosatu affiliated unions will join, or if the unions don’t, their member will come across. But will the federation be able to break out of the old organising straight jacket? To organise the low paid and the precarious is an ambitious task. There’s growing evidence that innovative strategies to bridge the informal-formal “divide” are emerging in the Global South with successful attempts emerging in other parts of Africa . For example, in Ghana an alliance of informal port workers with national trade unions has been formed and is proving to be effective. Labour scholar, Rina Agarwala, has challenged the conventional view that informalisation is the “final nail in the labour movement’s coffin”. Informal workers in India, she demonstrates, are creating new institutions and forging a new social contract between the state and labour. New informal worker organisations are not attached to a particular party, nor do they espouse a specific political or economic ideology. It’s too soon to pronounce on the future of the new federation. But it’s clear that workers are increasingly rejecting traditional trade unions and forming new types of organisations that bring workers together to promote their rights and interests. The future lies with unions that are forward looking and see the global economy as an opportunity for a new kind of unionism. Saftu needs to draw on these experiences if it’s to fulfil the promise of its launch. Edward Webster will be launching next month a collection of research based essays on precarious work in India, Ghana and South Africa. Crossing the Divide: Precarious Work and the Future of Labour, together with Akua O. Britwum and the late Sharit Bhowmik.